Enjoy original Neapolitan pizza, savory Italian appetizers and much more in the beating heart of Neukölln! The name of the restaurant, Monella, it is not by coincidence, and if the first thing that comes to your mind when reading the name is the famous movie of Tinto Brass (late 20s) then you guessed right. 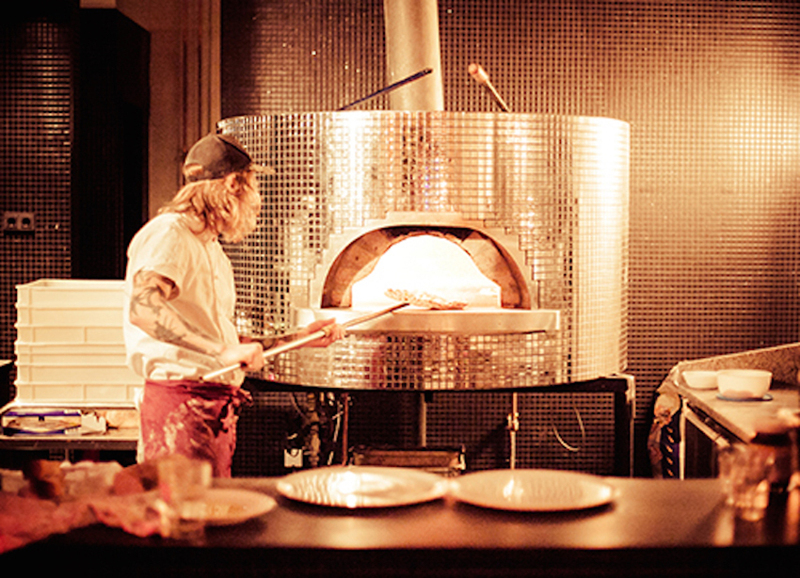 “My passions are cinema and Neapolitan pizza” tell us Seba, one of the owners. “When Kate and I, my business partner, decided to open a pizzeria, we wanted to use a name that recalls the cinema and at the same time was in line with the spirit of transgression of the Neukölln district”. Searching the real Neapolitan pizza. “In Germany the real Neapolitan pizza is almost impossible to find, when we tasted it for the first time we immediately fell in love with it and so we wanted all the Berliners to taste it as well. At the same time we wanted to open a place that combines good food with good music. The chance came suddenly; when some friends told us that there was a place available in Weichselstraße we immediately went to inspect it. At that time it was a Späti, this means it needed several renovation works to transform it in a restaurant, but we did not give up and we took that challenge. After three months of searching for the perfect pizza chef, one day Marcello, a Neapolitan guy who loves the traditional cuisine, knocked on our door. We immediately understood each other perfectly: we were looking for a pizza chef who could make a real Neapolitan pizza and he was looking for a restaurant in which he could do the typical pizza of his territory. It is been exactly a year now he is working for us and he has become the head of the kitchen. Thanks to his work, a survey recently published on Falstaff magazine has named us the second best pizzeria in Germany”. A menu to never get bored. “90% of our products directly comes from Italy, from where we import typical Neapolitan products such as dairy products, cold cuts and, most of all, the fresh seasonal products. We are categorically against frozen products and in our kitchen we want only fresh, seasonal products. This is why our menu changes every month depending on the available products. Every month we discuss, we study new recipes and change the type of pizzas in the menu, and also the appetizers and the desserts. This month new entry is the fried pizza, which has already had a great success. Moreover, we recently decided to dedicate the menu of Friday to fish. The tradition of fish food is typical of the Neapolitan culture, thus it seemed right to introduce it to our customers. Every Friday we offer several pizzas with seafood such as the classic seafood pizza, but also the pizza with fresh anchovies and Piennolo tomatoes, and pizza with prawns. I always try to rely on the traditional pizza but since we are in Berlin and we are dealing with a multicultural public I open myself up to experiment new flavors and new combinations. For example, this month we have the pizza with figs, and the pizza with pumpkin and porcini, both a real revelation that conquered everybody”. Much more than a simple restaurant. “What makes Monella perfect for the Neukölln melting pot area is the combination of the best from our cultures. Marcello’s Italian cuisine meets the South American cocktails make by Seba and everything runs smoothly thanks to Kate’s German organization. When the kitchen closes, around 23, the bar remains open and the restaurant is transformed into a cozy place where you can enjoy both the best traditional cocktails and the typical liqueurs of South America as the Chilean Pisco and the Mexican mescal. The bar often organizes different events with many DJs, bringing the best of the Berlin music scene to the restaurant”.